With so many new marketing campaigns and recent trends moving toward healthier grocery shopping, smart eating and light cooking, consumers are now more aware than ever of the importance of the nutritional content in their food. However, it can sometimes be extremely difficult to understand the meaning of food labels. As a wellness management company, we are certainly glad to see health become more popular in recent years, but we’re also aware of the food industries’ attempts to reel consumers in with fancy snippets of “healthy” sounding jargon that make products out to be better than they really are. In order to help you become a more educated and truly healthy shopper, we have compiled a list of often misunderstood and potentially misleading food labels…as well as their true, hidden meanings. This food label can be found on everything from fruit snacks to toaster pastries and in reality only means that the product contains some amount of real fruit, which is often just the amount that is accounted for from the use of fruit juice. The amount of “real fruit” in the product is typically so low that it has no nutritional value whatsoever and many of the products that boast this label have salt or sugar listed before any fruit ingredients. This kind of advertising really helps make our point about why deciphering the true meaning of food labels can be harder than it may at first appear. When it comes to grain products, a good rule of thumb is that the first word in the list of ingredients should be “whole.” Anything else, including “enriched,” indicates that the product you’re looking at is not all that good for you. To get the most nutritional value from grain, it needs to be coming to you in its purest form. Adding a certain number before the word “grain” only tells the consumer that there are many types of grain in the product, but it does not actually tell you anything about the quality of those grains. This list could include grains like refined white flour. Because this phrase sounds so appealing, many consumers are lured into its trap and could easily wind up with a grocery cart full of “all natural” sugary drinks, salty chips and other processed and unhealthy choices. When shopping, it’s important to keep your perspective straight and not let attractive sounding advertising like this phrase veer you away from your goals. Knowing the true meaning of food labels like this one can help us ignore flashy advertising and stick to business! 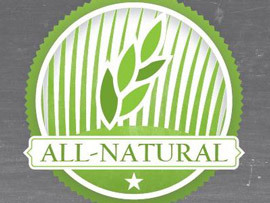 If the product truly was “all natural” in the sense that you were probably hoping it was, then you should be able to pronounce and recognize most or all of the ingredients listed on the label. While this label may be technically true, it is often just an attempt by marketers to get consumers to buy more of their processed, factory made goods. A big goal for shoppers who want to be buying, cooking and eating healthier food should be to come out of the grocery store with more fresh produce than processed foods. While you might technically be getting some fruit or vegetable content in your frozen TV dinner, that serving is barely offering you anything of benefit since the phytonutrients that are used to make that fruit or vegetable good for you have been long gone for quite some time. So, rather than get your daily “fruits and veggies” from foods in boxes or cans, why not pick up some real, out-of-the-dirt fruits and vegetables to eat as snacks and incorporate into meals?